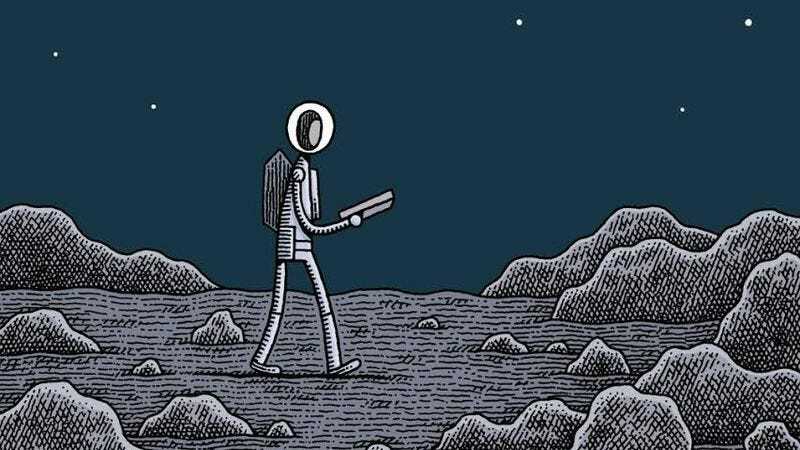 Tom Gauld’s Mooncop is one of this season’s most hotly anticipated new graphic novels, and it arrives in stores today for readers craving Gauld’s deadpan humor, refined cartooning, and meaningful observations on the human condition. The Comics Panel review of Mooncop explores the complexity of Gauld’s composition, and while the art style may look simple on the surface, there’s a lot of thought that goes into the visuals. This exclusive excerpt from Mooncop introduces the robotic therapy unit sent by the titular character’s superiors to treat his growing depression, and it’s quickly established that this robot is going to be no help at all. It can barely do basic functions like moving on the rough terrain of the moon, so it’s no surprise that the robot fails to be an effective therapist. The difficulty of interacting with the therapy unit is contrasted with the ease of Mooncop’s interactions with the human barista at the lunar café, subtly reinforcing the value of human relationships in an environment that is becoming increasingly automated. Mooncop is filled with those kinds of quiet insights, and readers can explore the unexpected depths of the story by picking up a copy today.